Two powerful dairy organizations, The International Dairy Foods Association (IDFA) and the National Milk Producers Federation (NMPF), are petitioning the Food and Drug Administration to allow aspartame and other artificial sweeteners to be added to milk and other dairy products without a label. The FDA currently allows the dairy industry to use "nutritive sweeteners" including sugar and high fructose corn syrup in many of their products. Nutritive sweeteners are defined as sweeteners with calories. This petition officially seeks to amend the standard of identification for milk, cream, and 17 other dairy products like yogurt, sweetened condensed milk, sour cream, and others to provide for the use of any "safe and suitable sweetener" on the market. Although the FDA considers aspartame to be a "safe and suitable" sweetener, a recent Yale University study appears to directly challenge the claim that aspartame would reduce obesity. In fact, the study concluded just the opposite, that artificial sweeteners actually contributed to obesity and Type 2 diabetes. The IDFA and NMPF argue "that the proposed amendments to the milk standard of identity would promote honesty and fair dealing in the marketplace" yet they don't want changes to the labels on dairy products. It's unclear how consumers can more easily identify the overall nutritional value of milk products that are flavored with non-nutritive sweeteners without labels. Quoting Section 130.10 of the Nutrition Labeling and Education Act of 1990, the dairy giants claim a new label is not required because sugar is added to milk without labeling it, and "the modified food is not inferior in performance" and "'reduced calorie' (labels) are not attractive to children" so marketing as such is of no benefit or detriment. The FDA has opened public comments until May 21 for anyone interested to "submit comments, data, and information concerning the need for, and the appropriateness of, amending the standard of identity for milk and the additional dairy standards." 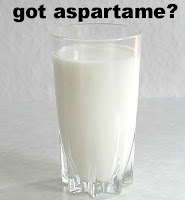 To submit a formal comment or send data to the FDA concerning adding aspartame and other artificial sweeteners to milk products CLICK HERE. This page contains a single entry by sal published on February 25, 2013 12:13 PM. Over-the-Counter NSAID Kills, But Docs & Regulators Ignore Evidence was the previous entry in this blog. 10,000 Crazy Vaccines! The Harm Done by Offit’s Claim. is the next entry in this blog.